The Tornado's Path - Epilogue: "Roll Call"
As Black Lightning offers Batman a lifetime membership to the Justice League Vixen, Hawkgirl and Roy Harper also agree to join the team. Green Lantern and Black Canary proudly give Red Arrow an R-buckle for his belt and Roy decides to take part in the family business by adopting the name Red Arrow. The previous day Black Lightning meets with Geo-Force to discuss the recent attacks on the former Outsider. Geo-Force rather graphically displays why he was responsible for the attacks by jamming a rock into his hand. The blood seeps into the ground and after a moment the ground begins to shake and a hand erupts from the earth. Black Lightning realizes that somehow Geo-Force has gained the late Terra's powers. Geo-Force asks him not to tell anyone until they figure out what's going on. Back in the present Red Tornado also accepts membership into the League. In the Batcave Batman leads Black Lightning through a teleportation device that takes them to the new Hall of Justice in Washington, D.C. Superman leads him on a tour of the complex, which includes a meeting room and a museum that is designed for the upcoming tours of the complex. They walk into what Black Lightning thinks is part of the Hall but soon discovers that he passed through another teleportation device that took him and Superman to the new Justice League satellite orbiting the Earth. Wonder Woman shows off "the Kitchen" which is the League's combat simulator. At the site of the League's original headquarters Dr. Ivo tries to hide but is trapped by Starro, who has devious plans for the villain. Meanwhile Green Lantern and Green Arrow meet and discuss the first meeting and Red Arrow's inclusion into the team. Ollie is rather amused by the fact that they took a group picture and Hal is ready to point out it was Clark's idea. Later Batman and Black Lightning examine the unconscious Trident in an effort to identify him. His fingerprints are run through the system and all of the databases that Batman has access to come up negative save one; the Fortress of Solitude. Batman reveals that according to the computer Trident is from the thirty-first century. Story - 4: And so the League is set and the game is on, to quote the trailer from a rather underrated comic book film from several years ago. I'm not going to say that this is the Justice League that we always needed. It is, however, the League we need right now. I'm a firm believer that the Justice League, at its best, should reflect the current atmosphere of the DCU. The original League was very much of it's time, as was the seventies era League as was the Giffen era (the Detroit League was a noble effort) as was the Morrison JLA. Where the League always seems to falter is when the act stays too long and as nice as the last incarnation of the League (still front and center in JLA: CLASSIFIED) needed to move on. Meltzer has given us a League that is very much in the moment and brings in all of the classic elements from the League's history as well as a few new touches to give it a new and fresh feeling. And it appeals to those who really like super-heroes and the trappings that come along with the genre. Or rather it appeals to me, which is always nice. This issue was interesting to review because the main thrust of the story was to introduce the new League without a major super-hero battle getting in the way and to show off the new headquarters and when I write headquarters I do mean that in the plural since Meltzer rather wisely had his cake and ate it too. I absolutely love the concept that Meltzer not only included a satellite base of operations but an honest to goodness Hall of Justice as well. That's just awesome. Meltzer continued the strong characterization from the previous six issues here and this is what made this story more than a "here are the new guys and here are their new digs" type of deal. It was more than Superman, Batman and Wonder Woman letting go and realizing that the League was bigger than them. It was more than the neat little twist involving Geo-Force. The heart of this issue was the relationship between Roy Harper and Oliver Queen. They never spoke through the entirety of the issue, but it was the father stepping back, for the right reason this time, and allowing the son to assume his rightful place. This is why Roy adopting the name Red Arrow doesn't bother me in the slightest. It makes sense and is powerful in its own way. And I loved the photo at the end, especially since it was Superman's idea. The only problem I had with this issue was the pacing. It was very jumpy going one from location and time period to another, which made the flow of the story rather choppy. Despite this it was a very satisfying issue, especially with the Starro and Ivo bit towards the end and the prologue to the upcoming crossover with the Justice Society of America. Personally I am really looking forward to this as I have always been a fan of those two teams meetings. I really can't wait for next issue. 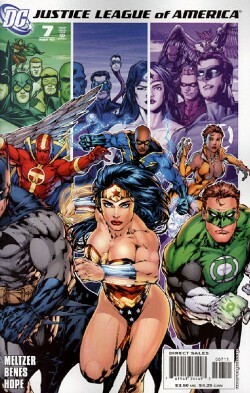 Art - 5: This issue highlighted why Ed Benes (along with Sandra Hope) is the best choice artistically. He gave us the grand epic mama jama shots that this story called for. Usually I am not a fan of successive two page spreads, but in this case you almost needed it to show how big the new Justice League is. 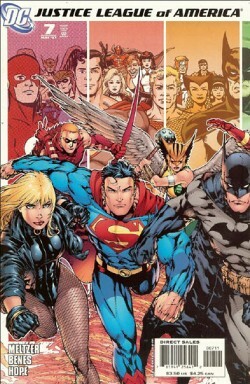 The two highlights were the opening shot of the Hall of Justice and the group photo. The detail on the Hall was simply amazing and took me back to Christmas 1985 when I opened that Super Powers Hall of Justice playset. The group shot was cool on its own but the "photos" behind them made it truly special. Also it was a gatefold page. You don't see that much anymore. This art deserved it. Cover Art A & B - 5: (Standard Covers by Ed Benes and Gene Ha) Shouldn't that be Ed Benes, Gene Ha, Eric Wright, George Perez, Luke McDonnell, Drew Geraci, Kevin Maguire and Howard Porter? Just asking. This was a truly amazing set of covers. This is one of those times where the cover should be the kind of event this one was because this new League should be a big deal. Yeah, if you want the complete image you need to spend seven bucks total, but frankly I think this one is worth it. One of the true tests of any current cover is would you put it on your computer desktop and DC wisely gave us that at their website. It's also one of those covers where you really need to study it to truly appreciate it. Cover Art Alternate - 4: (Alternate Cover by Michael Turner and Peter Steigerwald) As a variant cover this works out just fine. 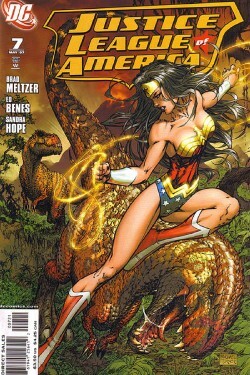 I never thought about the concept of Wonder Woman: Dinosaur Hunter, but it looks cool just the same. No real complaints here.